Provided by Lawson-West Solicitors - L-R Gagandeep Ghuman, Rashyl Parmar. 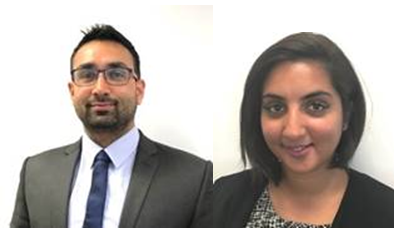 Leicester’s Lawson-West Solicitors have made two additions to their residential conveyancing team, with the addition of Gagandeep Ghumaan and Rashyl Parmar. In their new roles the pair will be supporting buyers and sellers throughout the conveyancing process. With over two years’ experience in the industry, Gagandeep has dealt with a wide range of conveyancing issues including re-mortgages, transfer of equity, freehold and leasehold sale and purchase and help to buy equity loans. Similarly, Rashyl is experienced in all areas of conveyancing, having qualified in 2017. In her role she deals with sales and purchases of properties, with specialisms in rights of way and unregistered land complexities. Lawson-West Solicitors are experts in a variety of legal issues including family and divorce, employment, residential conveyancing, wills and probate and litigation. The firm is committed to developing its team of experts. Sharon Sangha, the head of residential property at Lawson-West, said: “We are always looking to bring talented people on board. We always have our clients at the forefront of our minds, something that both Gagandeep and Rashyl embody in everything they do.